Anuradha Vijayakrishnan is the author of Seeing The Girl. Anuradha Vijayakrishnan goes to the gym every night. But she doesn’t practise yoga or even pack a pair of trainers. In fact, she doesn’t even leave the house. “I go to the mental gym,” the banker-novelist laughs. That’s her way of explaining why she takes time out to write poetry every night. It’s a habit she can’t break even after publishing her first novel, Seeing the Girl, which was long-listed in its manuscript form for the inaugural Man Asian Literary Prize in 2007, and published only earlier this year. But Anuradha, 39, is not your average writer. She’s a chemical engineering graduate who later did a masters in management and found her calling in the banking industry. In her day job she quickly rose to vice president of credit card operations at Citibank in Chennai, India, and moved to Dubai where she’s a consultant. 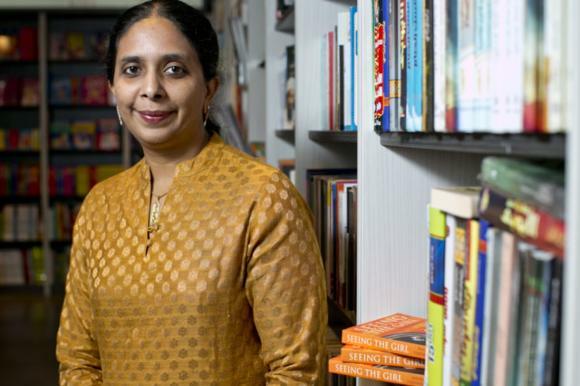 She juggles her writing and working life with looking after her two children – daughter Vishnumaya, 10 and son, Devnarayanan, three – spending time with banker husband, Deepakchandran, has no house-help, and claims to be a ‘fairly maniacal mother’. Which is why when the children are in bed and chores are done she finds time to write. However, she’s not very ambitious where her writing is concerned. “I love being creative,” she smiles. She’s just not interested in becoming a bestselling author. She even had to be pushed into writing her first novel. As a result of that Anuradha was invited to attend a Granta function in London, and met many literary luminaries, including David Godwin, the celebrated literary agent who has represented Arundhati Roy and every Indian winner of the Booker Prize except Salman Rushdie. So, with an almost guaranteed hit with David Godwin’s support and literary clout, why did she demur? “The reason I didn’t go back to David was because I didn’t have a contract with him,” she says. “He spoke about me in the press and that was how it all got blown out of proportion. So, was that why she took so long to publish her book? The answer is a firm no. “That is typically what everybody asks me – why the hiatus?” she says. “It doesn’t feel like that for me because publishing is not necessarily the natural corollary to writing. For me, writing is not a commercial activity; it is something I do in my spare time. In fact, it required a lot of push from others for me to think of publishing. For me, reaching the end of the manuscript itself felt like an achievement as I spent several years tweaking and refining the text until I was happy from a creative perspective. Seeing the Girl hit the bookshelves in India earlier this year and was launched in Dubai last month. Certainly, Seeing the Girl is not your conventional fiction. The story of three women – a mother and her two daughters – who influence each other (‘dangerously’, says the blurb), the reader will be at a loss to slot it into a genre. It’s an engrossing tale of a family, Janaki, Leela and Amma, who are all woven into each other’s lives so intricately that in the end it is difficult to critique them separately. In a way, it is in the form of looking at truth from different points of view. The language is lucid, and Anuradha has the capacity to make us see humour even in pathos. It was a natural leap from short stories to a novel, but she hesitated to commercialise it. “I used to primarily write poetry and short fiction – people egged me on to write this after reading my short stories,” she explains. “I was cutting off my stories at a point when they felt they were supposed to go on – the characters deserved longer lives. I, too, felt that but I liked to cut off at that point. “Short stories and poetry are difficult genres to place commercially; novels are much easier to sell. But that was not my perspective at all – it was just the creative satisfaction of writing. Some of my well-wishers pointed out that some of my stories could have been stretched into novels. Like Seeing the Girl. Initially it was born as a very short short story! But when I thought about it in that light, it just began to flow into a novel. There was no plan as such, just blind writing. Coincidentally the inaugural Man Asian Literary Prize was announced and friends told Anuradha to enter, as they were still accepting unpublished manuscripts at that point. Seeing the Girl was one of the 15 novels long-listed. Instead of giving into pressure, Anuradha used the time to go back to the manuscript and fine-tune it. “It was a process of seasoning, so to say, before it matured into something worthy,” she says. “It grew over time, not in the body and spirit, but cosmetically. I would say I made it a little more accessible to the reader. Anuradha explains why she wasn’t interested at first in novels was because of her first love – poetry. “I started writing poetry at college, at the age of 17,” she says. “That was also when I encountered renowned and controversial Indian poet and writer Kamala Das, who took me under her wing, critiquing my poetry. So now she’s a literary success, how will she juggle her myriad roles going forward? “I believe that you don’t have to give up anything to do what you want to do. I am a fairly obsessive mother to two kids. I want to be the best mother possible; my children are very important to me and I don’t mind at all the time I spend with them and the effort that goes into parenting. There are 24 hours in a day, and if you don’t use them wisely then that’s just too bad.